Science gallery is an initiative taken to create a platform that plays a major role in igniting creativity and discovery at the conjunction of science and art. Through a dynamic ever-changing roster of exhibitions, educational workshops, training programs and public events, the science gallery will be a teleport for visitors into a stimulating and captivating environment that supplements the desire to grow and learn more and generate a gateway to scientific temperament. Bangalore is a place for scientific and creative innovation which provides an outreaching platform for sharing ideas, projects and approaches and enables young adults to become the future innovators. The new campus of Science Gallery, Bangalore is envisaged to be a unique addition to this ecosystem. A building complex that could complement the transforming nature of Bangalore thus formed the basis of this design proposition. The concept of breaking up the built and integrating it with open spaces rather than placing a single building block opened up a whole new opportunity of experiencing and engaging with scientific technologies and innovations at a primary level. Provision of diverse types of spaces in workshops, exhibitions, formal and informal spaces has been explored to maximize the interest of young minds. Connect – Engage – Explore is a concept generated on the basis of which, this Gallery has been designed to envisage the dynamic and innovative character of Bangalore. This concept has been implemented to develop a binding connection between the city and its scientific temperament. This has been done by creating a transparency between the innovations in science and art and the people through the medium of design of the built environment. Visually transparent connection between the city and the public building is crucial in order to make people aware of such a holistic building complex and to encourage the in-flow of visitors not only regarding scientific innovations but also as a congregation place. Sensitively planned built environment allows individuals to constantly engage in various activities taking place in the complex and enhance their trail of thought. Exploring different typologies of spaces etches a distinct memory in an individual’s experience in understanding science and technology. The complex has tried to visually open up at an urban and a building level to create connections between the city and the building complex as well as the people and the built environment. Accessibility and permeability of the building plays a primary role in facilitating this connection. 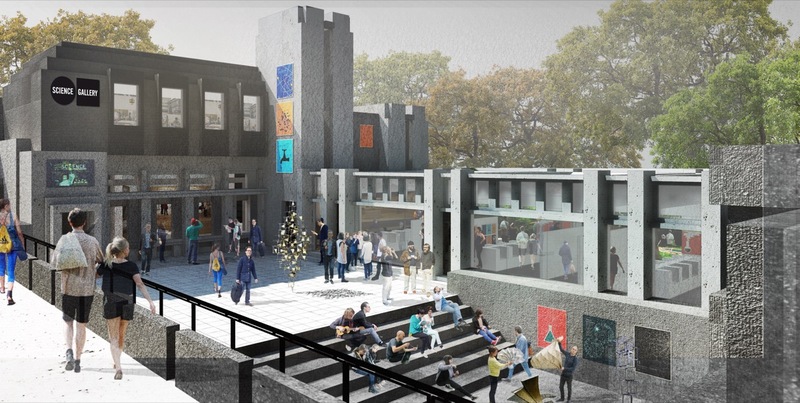 As the complex is situated adjacent to a major link road, the design takes the advantage of being a public building to connect to the city through an open plaza on the main road which provides for a large congregational space and encourages in-flow of visitors. Also to connect to the city, the building is designed porous in nature. The overall built mass is planned as a cluster of separate blocks. Single storied building blocks are placed at the complex periphery to encourage barrier free visual connection. Large public squares and courtyards work in combination with defined access points and form walkways to facilitate free and organic movement patterns within the complex. Science Gallery Bangalore is envisaged as a comprehensive building that ensures visitors to engage in activities at all levels through various planning strategies. Experience with the space and its elements is an important part of engaging young minds with scientific discoveries, thus, the building design progresses in a way that captures attention of the visitors by creating a visually attractive environment that further generates intrigue and inquisition in the observer. The low height of the building complex reinforces the visual connect between upper levels and the public spaces at ground level through large public terraces, roof-top cafeteria and skywalks. The skywalk is designed from the front plaza on the main link road to the cafeteria block to encourage in-flow of visitors and facilitate recreational services to passersby. A courtyard is provided in the central region of the complex which acts as the dynamic center at the ground level and connects various functions together. Exhibition galleries, corporate zones, cafeteria, retail shops form various edges of the central court and expedite the young minds to be interested in the different activities taking place in it. Diverse typologies for exhibits have been explored in the building complex. Unique identity of the galleries is defined by incorporation of specific forms and functions creating distinct experiences for visitors in every space. 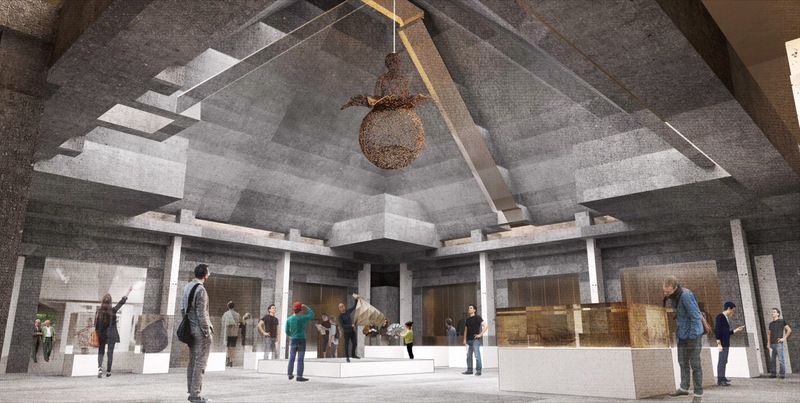 The monumental scale of the pyramid gallery creates an overarching experience for the visitors. The large floor plate enclosed by the gallery is flexible and can be subdivided into multiple parts. 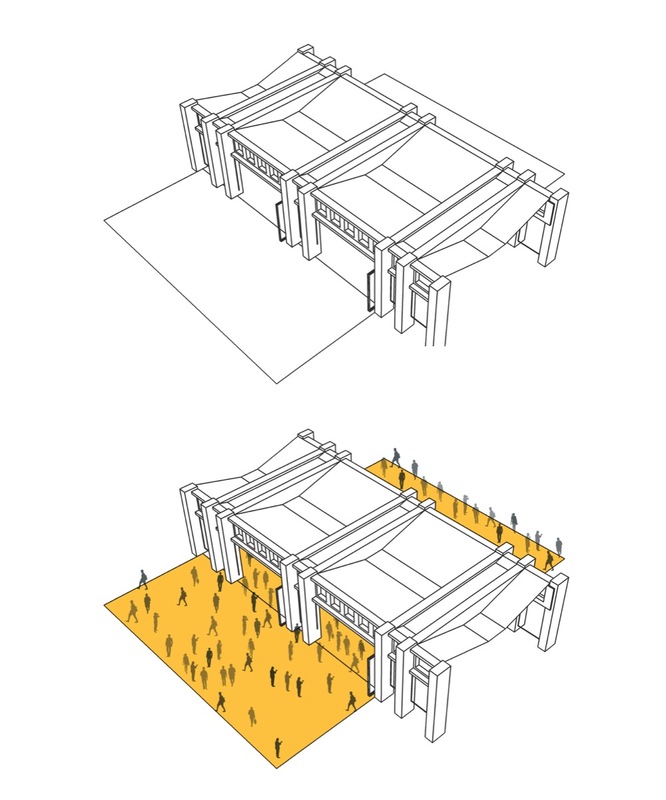 Temporary exhibition spaces work in conjunction with outdoor public squares to provide flexibility. 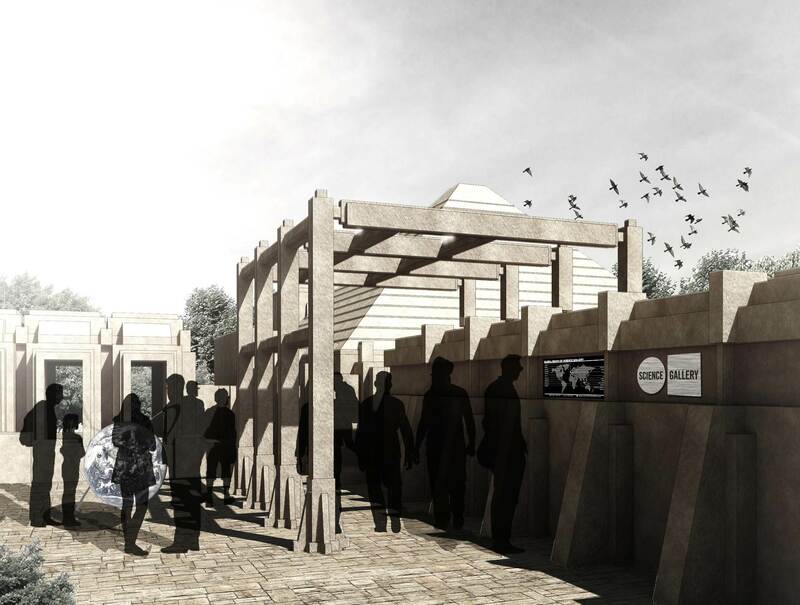 This provides a spill out zone to display large outdoor exhibits and provide an interactive and engaging exhibition space. Live exhibition spaces are formed by integration of studio/ workshop areas with visitor gallery space. This conjunction of zones provides opportunity of real-time exhibitions where visitors can observe artists and researchers at work and create interest for the user. Outdoor public squares/ plazas and walkways comprise of recessed alcoves and niches that are used for public exhibits and allow the users to constantly engage with science and art technologies. Building complex and its façade thus provide an interactive display canvas for exhibitions. The Science Gallery Bangalore is an architectural work that has very comprehensively fostered an empowering environment. It has been sculpted specifically in order to experience a captivating dynamism by providing a holistic meeting place rather than solely being an exhibition space. The porosity and openness of the complex wantonly invites the city and its people to be a part of it and creates a unique identity in Bangalore.